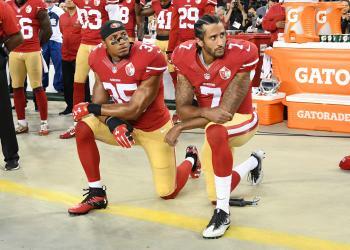 Colin Rand Kaepernick (kap-ƏR-nik; born November 3, 1987) is an American football quarterback who last played for the San Francisco 49ers in the National Football League (NFL) in 2016. Kaepernick played college football for the University of Nevada where he was named the Western Athletic Conference (WAC) Offensive Player of the Year twice and became the only player in NCAA Division I FBS history to amass 10,000 passing yards and 4,000 rushing yards in a career. NFL draft 2019 news and rumors: Will Nick Bosa's tweets hurt his stock? "The View" co-hosts discuss Nike's controversial new campaign.